Heinz Waaske worked for Wirgin, where he designed the Edixa Reflex 35mm SLR, the Edixa Electronica leaf shutter automatic SLR, the Edixa Stereo and the Edixa 16 subminiature and its variants. 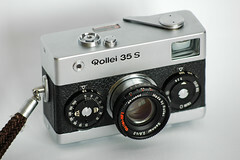 He proposed the design of the future Rollei 35 to Wirgin, but they refused to go ahead with the project and he moved to Rollei, who launched the camera and met with great success. He designed other cameras for Rollei, like the Rollei A 26, Rollei A110, Voigtländer Vitoret 110 EL and Rolleimatic. 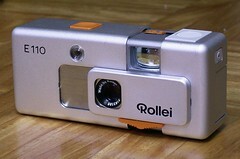 Later he quit Rollei and worked as an independent designer. He worked on the ideas of Hans Domnick who was proposing a system of cassettes, interchangeable in mid film, and made a prototype of a cassette SLR with the Rolleiflex SL35 lens mount. At the same time, he was working on various design concepts for Minox, among which the Minox 645 GL (a 4.5x6 folding rangefinder camera), a 35mm interchangeable lens rangefinder camera and evolutions of the Minox 35 with interchangeable lenses. For Carl Zeiss he developed a film cassette for the Axiophot microscopes. His latest developments were automatic room control cameras for film. Kameras für Millionen - Heinz Waaske - Konstrukteur, by Jörg Eikmann and Ulrich Vogt, is an invaluable reference, and has many interesting pictures even if you do not read German.